The aim of this series of SpeakUP! events is to introduce and to promote the idea of fans’ self-policing in the sense of self-regulation and fans’ self management and to increase the capacity of football scenes to regulate violent and racist behaviour of their members responsibly on the basis of peer pressure and the motto “Speak UP!”. As the first of several SpeakUP! 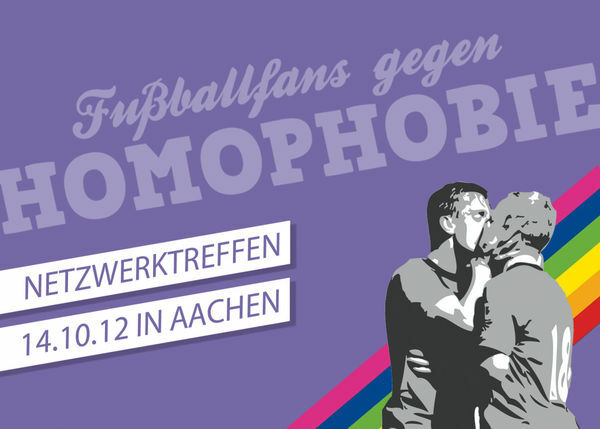 Events in the framework of the FSEs activities in the pro supporters project, a network and coordination meeting of the initiative “Football fans against homophobia” was held in Aachen/Germany on 14 October. About 70 people from more than 25 different supporter groups, including representatives from FSE and QFF, but also overall anti-discrimination bodies such as FARE and Pridesports were represented at the meeting. While “Football fans against homophobia” had, until recently, been a campaign organised by just a few people, the meeting has proven most helpful in getting the workload shared between several fans groups and to initiate new projects in the framework of the initiative and to take it to the next level. Amongst other things, participants prepared an info brochure on homophobia and sexism in football. Likewise, first ideas for a lecture and general educational work on the topics were elaborated. In a third, “European workshop”, it was agreed to strive for an increased networking amongst each other and to take the campaign to further European countries. As a first result, in the next months, an English version of the „Football Fans Against Homophobia“ banner will be ready to be sent around between interested fans’ groups across Europe together and info material will be translated into several European languages. More info will be available in due course via the Football Fans Against Homophobia Homepage and via Facebook.